We are staring a new resolution here at the Celtic Times corner, a shout to an honoured Celtic Times Heritage website of the week: www.museum.ie. Check out the National Museum’s website for an update on what’s up at their venues in Kildare Street and Collins’ Barracks in Dublin (there is a museum link bus to shuttle visitors between the two locations), and at the Museum of Country Life in Castlebar, Mayo. Make sure not to miss out on the Bog Bodies exhibition. There is a very convenient museumlink public service bus for ease of access across the capital. With world renowned curators and conservators from Ned Kelly of the Tallaght Mountains and Ballyportry’s own Dr Pat Wallace to CSI’s Paul Malarkey, their collections are an intrinsic part of a cultural visit to Ireland. Remember too, they are free, and purchases at the museum shop will go towards their programmes. In due course, it is the earnest wish of this parish to see the National Museum of Sport to soon take up residence in Ireland’s Shannon Region, now is the time to be bold, and to not waste the opportunity of a right good recession; watch this space. 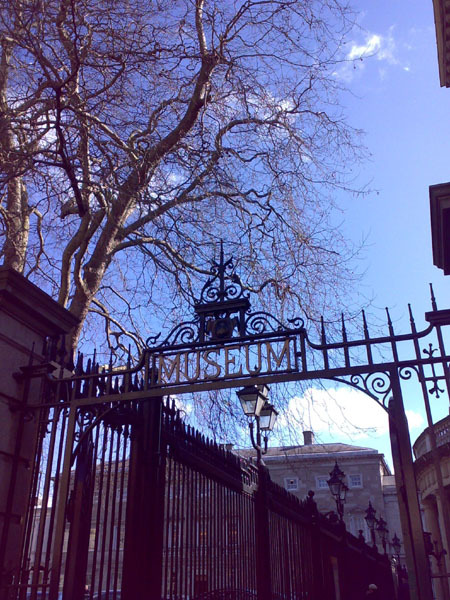 Don’t forget also that ancient and beloved museum of a museum, the Natural History Museum in Merrion Street, just a stone’s throw from the Kildare Street venue. It is Ireland’s great Dead Zoo.